If you missed the first part of this article I covered the issues faced in terms of aero as we head towards another tectonic shift in the sport and Liberty exert their will onto the regulations, making changes to suit their commercial interests but also, hopefully, improve the sport we (kinda) love. In this second installment I’m going to concentrate on the powerunits, why things went so wrong, what lessons can be learned (come on this is F1, we don’t learn lessons) and what’s the most likely outcome of any changes for 2021. The hybrid powerunits have been the most polarizing element of F1 for the last three years, with aero being a problem that needed to be fixed for decades. However, this needn't have been the case had it been for better leadership. Predominantly all four of the main issues could have been resolved if the sport and the people within it had done a much better job at framing the regulations and selling it to the fans. Instead the first articles that appeared in regard to them were key figures like Bernie Ecclestone and Luca Di Montezemolo blasting them, labeling them as a huge waste of time, money and effort and they’d struggle to sell the product to the fans, circuit owners and tv companies. An early complaint that ironically made more noise than the powerunits themselves was that the hybrid technology had dampened the noise emitted by the cars to a dangerously low level, with fans apparently turned off in swathes by what many saw as the manufacturers hoodwinking the FIA. The issue is not volume though, rather one of pitch, with the V8’s essentially wailing in a much higher rev range than the hybrids, which are artificially capped at around 11,000rpm rather than 18,000rpm. 2015 saw the introduction of separate wastegate exhausts, a token gesture by the manufacturers to change the pitch of the ICE, which will forever be quelled by the mere fact it's breathing through a turbocharged system that's further attenuated by the MGUH connected to it. Formula One is a fragile economic eco-system, based on a model that was previously designed by the sports Tsar, Bernie Ecclestone, and whilst now outdated you cannot fail to recognise the wonderful job that he did whilst at the helm. The introduction of the hybrid powerunits was not controlled enough by the sport, this is a fact but since then measures put in place to hold costs and development down have also been derailed. The homologation process was the first to go by the wayside, enabling the ‘works’ entities to run a specification ahead of their customers for a period they see fit, whereas previously powerunit updates had to coincide with one another. Then we had the abolition of the token system, granted the matrix was difficult for many to understand but I have to wonder how many people are that bothered anyway? Ask even the hardened fan about the technology involved in the V8 era, such as blown diffusers or cylinder deactivation and a bemused face will greet you. Formula One, like many endeavours in life is layered and we can make things simple or technically orientated for the fans, as long as it’s communicated well. Circling back to the token system, which was scrapped in order that Honda and less so Renault could catch up with Mercedes and less so Ferrari, who’d stolen a march. The problem with this is multi-faceted too, with the frozen (up to that point) elements of the powerunit now reopen for development, giving Mercedes and Ferrari more scope with which to play with and stretch their legs in opposition to Honda and Renault’s advances. At the time I was bemused as to why, if parity is what was sought, did they not freeze elements of development for Mercedes and Ferrari, allowing the others a period to make advances on their rivals, much like an agreement that was made during the V8 era, when engine specifications were totally frozen. Homologation and token system loopholes aside the single biggest issue with the hybrid units is that no financial ceiling was placed on their development or supply, with numerous teams feeling the pinch as prices soared to at least double of the V8. A supply of V8’s for a season back then (2006) from Cosworth would have cost £5 million (€7 million, based on the historic exchange rate - 1.4), with KERS (2010 - estimated, as they didn’t produce their own iteration) £8 million (€9.44 million, based on the historic exchange rate - 1.18) and a projected cost of £12 million for a hybrid powerunit, had they continued development (€15.1 million, based on the historic exchange rate - 1.26). Having seen things spiral out of control, the FIA have now specified the cost to customers within the regulations at €12million from 2018 (£10.5 million based on the current exchange rate), putting them in league with Cosworth’s projections. However, one thing that always irks me in regard to cost is that for years everyone had talked about aero dominating the sport and the associated costs that come with it, something the introduction of these more complex powerunits would change given the additional engineering challenge. Alas, with no set spending or resource limits in play the teams and manufacturers rode roughshod over that theory with F1’s cottage industry still willing to churn out aerodynamic update after update, no matter the cost. It’s a problem exacerbated by the gulf in payouts to each team from FOM and income from sponsorship deals that they’re able to do - with the likes of Mercedes, Ferrari and Red Bull simply able to outspend their less wealthy counterparts. Therefore the regulatory framework for any new engine is going to have to coincide with a redistribution of the sports wealth and with it we will undoubtedly see both a changing of the guard but also a reallocation of the pool of sponsors that associate themselves with the teams. I’m not going to sit here and say the performance level of every team that competed in 2014 was acceptable but on the other hand we had a broken financial system whereby last place in the championship meant no money for the coffers and two teams that still trying to live the dream of being in a sport that was sold a lie - Caterham and Manor, albeit named differently at that stage had come into the sport on the back of a promise that a budget cap would be installed, something that may have helped them to compete. We must also remember that the regulations had cut downforce significantly once more for 2014, whilst increasing a designer's biggest enemy - weight. In short this means you need more downforce to accelerate the car through the corner and so we come to our first impasse, where the chassis and engine architecture were not considered as one. As soon as the teams started to claw back the lost downforce and understood how to run the powerunits at full tilt we did start to see some more representative times, in fact toward the end of the last regulation set the lap records, which have predominantly stood since 2004, had already started to tumble. The headline figure being produced by the manufacturers is circa 900bhp, which is up on their V8 counterparts but of course up until the change in regulations this year they’ve been trying to accelerate what is equivalent to a passenger around the track with less downforce. As soon as that conundrum was resolved the lap times have improved and so it brings us to the cornerstone of any decisions that should be made going forward, the power-to-weight ratio. Remember races in the 80’s and 90’s? Remember races that finished with just a handful of cars? Yea, we have short memories and rose tinted glasses when it comes to looking back at the history of F1 don’t we… Whenever I hear complaints about unreliability from these powerunits I’m minded of this, we’re pushing the technological envelope here guys, why should we expect all of the cars to finish the race without any complaints? So, let’s strip this back to the issues at hand and take a sideways glance at the peripheral issues that might be caused by returning to a much more simplistic engine, as has been mooted. Word on the street is that part of the strategy group, another element that will hopefully be disbanded in 2021 - as it’s not fit for purpose, are interested in a more simplistic version of what is currently being used - A V6 twin turbo with a more powerful KERS unit. On the face of it this solves several of the sports current issues and still facilitates the needs of the hybrid apologists, but is it the right way to go? Removing the MGUH deals with the issue of limited sound, given the ‘H’ attenuates the turbo’s rasp, quelling the rotational speed of the turbo as it recovers energy. The V6 layout overcomes the issues faced by the manufacturers who know too well that downsizing is part of their corporate strategy, as they look to meet environmental targets. The additional turbo means that even with the electrical energy losses the engine will be able to produce enough power to trouble the 1000bhp barrier, especially as it’s likely they’ll scrap the current fuel flow limit. 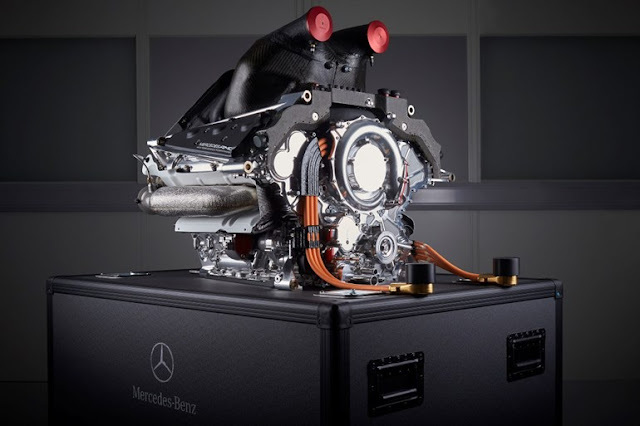 The other side of the strategy group, which includes Mercedes and Ferrari, have already invested heavily in the technology incorporated in the powerunits and feel that there are still legs in using the same technology. Their approach would see certain elements of the powerunit completely standardised and supplied by a single source, this includes the combination of turbo and MGUH, the MGUK, the Energy Store and the associated Control Electronics. In other words, a standardized ERS allowing development to put into the Internal Combustion Engine, with the fuel flow limit and delivery restrictions lifted slightly in order to add yet more power, raise the rev limit and increase the noise being produced. Standardizing the ERS also removes a barrier for entry, allowing the likes of Aston Martin, Ilmor, Porsche etc a way of entering the sport without having to invest in technology that is already mature and makes it a more cost effective prospect - something that needs to be passed onto the none constructor 'works' teams. It’s understood that the team assembled by Ross Brawn will present their findings to the teams, FIA etc at a meeting tomorrow (31.10.17), so I look forward to commenting on this as the details emerge. For me I’m constantly frustrated by the political motivations that shape these decisions and hope that having the working group has helped to keep things more balanced. I’m also frustrated that Formula One always draws these lines in the sand just at a point when we’ve had a period of stability and the racing becomes much closer. Of course it’s still only been a two horse race this season, with Red Bull joining in when the circumstances suit, but Renault - having focused more resources and money on Enstone toward the end of this campaign and McLaren - powered by the Renault and with a decent chassis, are both shoe-in’s for an ascent toward the front of the grid too. This is superbly written! Let's see what the FIA has to say. Did you et your Euro vs. Sterling exchange rate the wrong way around? Good catch Rob, I've just amended them, was obviously a late night when I writing that part but the sentiment still applies.